I made the costume to go along with our school theme G.A.M.E. on. (Going Above the Measures of Excellence) It was worn by myself. I used a large cardboard box cut into the shape of a square. Then cut a circle in the middle and covered it with colored butcher paper. To make the game spaces, I used paint sample cards that matched paper and tops of colored squares. I also used paint sample cards to make the monopoly chance and community chest cards. I put thin black ribbon to section of spaces and a slightly thicker one to place along top. I used labels to make wording and clip art for the monoply pictures and die cut letters for the larger letters. After gluing everything down. I wrapped back slightly overlapping bottom of front. Then taping blue tape over top. To make the game pieces, I spray painted a hot wheels car, small dog, mouthwash top, and a Christmas top hat silver. To make houses/hotels I used small foam pieces and left over paint sample cards. I hot glued game pieces and dice to Velcro on the board. Dice were purchased at dollar store. 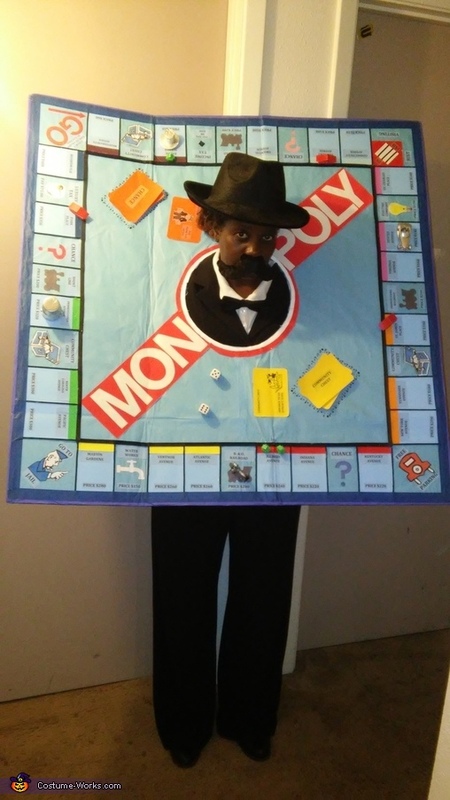 For monopoly guy, I purchased a hat, n put on a black suit with a black now tie. Them slide board over my head. Total cost: $25. Most expensive item was the hat $5. The hardest part was sectioning off the spaces.